If you have decided to end your marriage, there are ways you can do it that will limit the damage done to all parties, including your children. If you can, it’s good to end your marriage with integrity, clarity and respect for your former spouse and remember that if you have children together, you’ll need to work out a way to successfully co-parent. Be certain you want to end the relationship. Don’t threaten to leave in an effort to get your own way or make your partner change. If you still love your partner but are unhappy in the relationship, give counselling a try before you decide to end your marriage. If you try everything to save the relationship before ending it, chances are you won’t feel as angry and resentful when the split eventually occurs. Even if you have decided that the relationship is over, it is often a good idea to go to counselling either separately or together to talk through how the marriage will end, who will take responsibility for what, and you can continue to respectfully communicate. Take the time to talk. Plan on enough time to really talk. This conversation could take some time. And you don’t want to rush it. 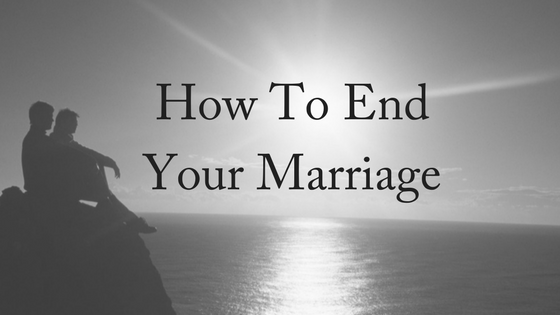 Your spouse may not want the marriage to end. Chances are you won’t be on the same page, and this may be a huge surprise. Give your spouse the time and space to have their feelings. This could be shocking and most likely deeply upsetting. Process feelings of grief and loss. 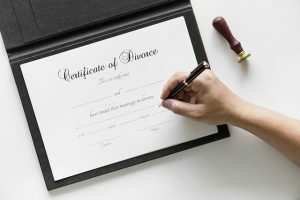 Divorce means a lot of loss: loss of your marriage, loss of your spouse, loss of your family structure, and loss of hope for your relationship’s future, for the marriage you hoped you’d have. There’s a lot to grieve here, even if you are the one initiating the divorce. You’ll probably find both of you going through the stages in grief at different times. Your spouse may just be in denial, or go through all five of the emotions/stages. It’s good to be prepared for all of them, and know how you’re going to handle those emotions, and have a general idea of what you’ll say. Don’t kill the relationship before you end it. Blame, criticism, accusations, complaining, and secrets may make you feel better in the short term, but in the long-term will be worse for all parties. Take responsibility for your choice. If you have children together, remember that you’ll still need to co-parent them together, and doing so successfully means being able to communicate respectfully. If you have to walk away, start with forgiveness. Forgive your partner for being human. Forgive yourself for choosing to leave. If you do so, you may still not be able to make a clean break, but you will be less likely to inflict harm as you walk out. Choose a private place to share your decision with your partner. Then prepare to stay calm if the response is anger or manipulative behavior. However, if you fear a violent outburst, make sure you seek your own safety first. Don’t attempt to calm your partner down. Be honest. Answer questions with kindness. Apologize for the pain they feel, but not your decision. If this is something you’ve been thinking about for a while, you’ve had a chance to process all your feelings. But your spouse may feel shocked or blind-sided, so prepare yourself for this. Moving forward. When you end your marriage, it’s likely that both of you will need some time and space. You’ll need to start untangling your marital lives, setting boundaries, choosing a divorce process, dividing assets, establishing support, creating a plan for your children (if you have them). There will be much to discuss. Relationships get more entwined the longer they’ve lasted, and unwinding a marriage takes time. Be patient with yourself and your spouse as you end your marriage. Make sure you seek sound legal advice when you’ve decided to end your marriage. For many people, family law can be a complex issue and at a time of heightened emotions, it can be helpful to receive objective, experienced advice. For your FREE 10-minute phone consultation, contact us today to speak to our friendly, compassionate family lawyers.